The Jewish News Service posted an article today about the attack in Tel Aviv last night. The article highlights five myths about terrorist attacks in Israel that are simply not true. Myth #1: “The problem is the settlements” – Tel Aviv is neither disputed nor a settlement. Myth #2: “It was a reaction to the occupation” – the village of Yatta, the home of the attackers, has been under the rule of the Palestinian Authority for nearly 21 years. “We condemn violence and attacks against civilians on both sides, whatever the justification.” The PA “not only condemned the attack in south Tel Aviv early on Monday morning, but also the recent Israel Defense Forces strikes on Gaza, and attacks against Palestinians in the West Bank and in Jerusalem,” according to Israel’s Channel 10 television network. Myth #4: “Ordinary Palestinians are against terrorism” – In Ramallah, Tulkarm, Qalqilya, Jenin, and other cities people danced in the streets. That doesn’t sound as if they opposed the attack. Until the PA stops celebrating terrorism, training its children to be martyrs, and teaching hatred of Israel, there will not be peace in the Middle East. You cannot have a two-state solution with people who want to exterminate you. It simply is not possible. CBN News is reporting today that the Vatican has officially recognized a Palestinian state. The leaders of Palestine have assumed that this means Israel will go back to the 1967 borders and that Jerusalem will be the capital of the new state. This is not a recipe for peace. Nations of the world have poured billions of dollars into the West Bank, one area the Palestinians are claiming for their new state. The current government of Palestine has used that money to buy weapons and build tunnels to attack Israel. The current government of Palestine has also refused to acknowledge that Israel has the right to exist. This is not a recipe for peace. “Formal Vatican recognition of Palestine, a state that, in reality, does not yet exist, is a regrettable move and is counterproductive to all who seek true peace between Israel and the Palestinians,” AJC (American Jewish Committee) Executive Director David Harris said. “There is a reason why the U.S., the European Union and others have long agreed that statehood can only be achieved through direct, bilateral negotiations between Israel and the Palestinian Authority,” he continued. “Meanwhile, the West Bank [Judea and Samaria] is ruled by the Palestinian Authority, whose leader, Mahmoud Abbas, just marked the tenth anniversary of what was meant to be a four-year term, and Gaza is governed by Hamas, a terror organization. What and where exactly is the ‘State of Palestine’ today?” Harris queried. “We are fully cognizant of the Pope’s good will and desire to be a voice for peaceful coexistence, which is best served, we believe, by encouraging a resumption of Israeli-Palestinian peace talks, rather than unilateral gestures outside the framework of the negotiating table,” Harris concluded. This is not a recipe for peace. It is encouraging a non-democratic government that supports terrorism in its quest to wipe out Israel. CBN News is reporting today that because of Prime Minister Netanyahu’s victory in Israel’s election, President Obama may stop American opposition to the United Nation‘s imposing a two-state solution on Israel. First of all, let’s look at this logically. When Israel turned over the West Bank to the Arabs, what did they get? They got suicide bombers and rocket attacks coming from the area. When the Arabs took over the land, the first thing they did was destroy the greenhouses that would have provided employment and a source of income. The money coming into the area from foreign countries was not spent on infrastructure–it was used to buy weapons and build tunnels to attack Israel. Why in the world would anyone want to give terrorists more land? The prime minister’s acceptance of two states has always been based on the Palestinians‘ recognition of Israel as a Jewish state, secure borders for Israel, and keeping Jerusalem the united capital of Israel. All three conditions were rejected by Palestinian Chairman Mahmoud Abbas. The administration is also hinting it may support the Palestinian Authority‘s petition to the U.N. Security Council on the unilateral establishment of a state. “Our position in support of a two-state solution is very clear. Only a two-state solution that results in a secure Israel alongside a sovereign and independent Palestine can bring lasting peace and stability to both people,” U.S. State Department spokesperson Jen Psaki said. “Of course, we will continue to pursue this goal with the new Israeli government and the Palestinian Authority,” he added. The notion of a Palestinian state next door to Israel troubles many Israelis after all of the terrorist attacks they’ve faced in recent years from Islamic fighters. If the United States and the United Nations do support such a deal, that could mean still more tension between the Jewish state and much of the rest of the world. This is a total turnaround from previous American foreign policy. The Arabs do not want a two-state solution–they want to drive Israel into the sea and kill all the Jews. That is not something America should be supporting. We need to remember that the Bible says that he who blesses Israel will be blessed and he who curses Israel will be cursed. The Obama Administration is about to put America in mortal danger. MyWay News reported yesterday that Palestinian President Mahmoud Abbas is seeking Palestinian admission to the International Criminal Court. The intention is for Palestine to charge Israel with war crimes. Abbas made the announcement in the West Bank on Wednesday, a day after the U.N. Security Council failed to pass a resolution that had aimed to set a deadline for Israel to end its occupation of territories sought by the Palestinians. Abbas’ decision is expected to trigger a harsh response from Israel. The fact that the originators of these rocket attacks on civilian targets want to charge Israel with war crimes would be laughable except that the International Criminal Court is so anti-Semitic the charges would probably be taken seriously. As the Palestinians seek to charge Israel with war crimes, we might also remember the tunnels discovered in their recent war with Israel. In July 2014, I reported (rightwinggranny.com) that the Palestinians plan to use the tunnels to hide until schools and kindergartens were occupied. The terrorists would then attempt to kill the children first, and then kill and kidnap as many Israelis as possible. This plot was set to take place during Jewish New Year, on September 24. Israel is not the one who should be charged with war crimes. Arutz Sheva reported yesterday that Indiana Governor Mike Pence, while visiting Israel with his family, declined a dinner invitation from Palestinian Authority Chairman Mahmoud Abbas. Governor Pence was also in Israel to discuss expanding economic ties between Indiana and the Jewish State. Governor Pence has been a long-time supporter of Israel. “I’ll be honest with you: I never thought I’d live to see the day that an American administration would denounce the Jewish state of Israel for rebuilding Jerusalem,” Pence added. It is wonderful to see a state wanting to do business with Israel. Governor Pence obviously understands that Israel lives in a dangerous neighborhood and does need to defend itself. There is no other country in the world that would put up with rockets continually being fired at their civilian population and not respond forcefully. 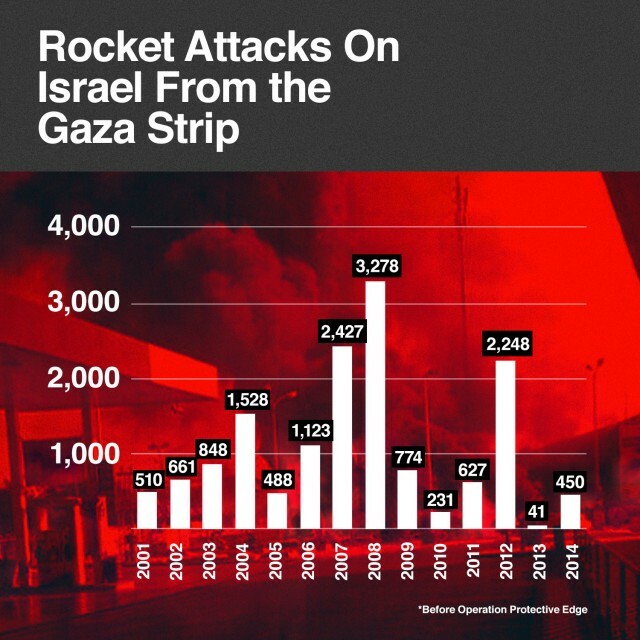 Israel has consistently tempered its responses. Why Are We Sending These People Money? According to fas.org, last year Americans sent $440 million in regular and supplemental appropriations to the Palestinians in 2014. This aid was sent at a time when America is borrowing 40¢ of every dollar it spends from foreign countries. As Israelis mourned the latest murders of four rabbis praying in their synagogue and buried the dead, some Palestinians took to the streets to celebrate the killings. The terrorists who allegedly carried out the murders were killed in a shootout with Israeli police. Two young men, identified in the Palestinian media as Ghassan Abu Jamal and his cousin Udayy, were reportedly members of the terror group the Popular Front for the Liberation of Palestine (PFLP). PFLP members danced in the streets and waved flags, while a woman threw candies to a crowd of Arabs. It is horrific that the four rabbis were murdered while they were praying, but the celebration afterward is over the top. American money is financing the hatred toward Israel that is being spewed by Hamas and other such groups. It is time that we pulled the plug on the money flow. Three of the murdered rabbis were Americans with dual American and Israeli citizenship: Moshe Twersky, Aryeh Kupinsky, and Cary William Levene. The fourth rabbi, Avraham Goldberg, was a dual citizen of Britain and Israel. Tuesday’s attack was the worst in Jerusalem since eight Jewish students were murdered at their yeshiva in 2008. It will be interesting to see if America or Britain are willing to change the way they do business with Palestinian Authority Chairman Mahmoud Abbas in response to the killing of their citizens. Do We Need To Support Terrorists When They Are Running Things? 1. Preventing terrorism against Israel from Hamas and other militant organizations. Those are noble aims, but what exactly what are we supporting? Hamas, a partner in the P.A. unity government, was more explicit. Fathi Hamad, a member of the Hamas political bureau, spoke about a vehicular attack in Jerusalem on the group’s al-Aksa TV last week. “We, the Hamas movement, applaud this operation and encourage anyone who can carry out more [such operations],” Hamad told his interviewer. “Even he who owns nothing but his faith has a kitchen in his house in which he has a knife. He must grab his knife and confront the Zionist enemy,” he continued. “Another one owns no weapon, but does own a car, he must push down on the gas pedal in order to take a revenge of the settlers who corrupt the land and defile the al-Aqsa Mosque,” he said. “I say, there must be an uprising now, a raging uprising first of all against the [P.A.’s] security coordination [with Israel] so there should be no restrictions; then, the Islamic Palestinian armies committed to al-Aqsa will set out toward al-Aqsa and Jerusalem until the Jews abandon their intentions,” Hamad said. America needs answers to some basic questions about our aid to Gaza. Is the money actually going to humanitarian aid or is it going to weapons? Why are we sending money to people who clearly promote violence? With comments like the above, is there any hope for peace between Israel and the Palestinian Authority? Yesterday The Times of Israel posted a story quoting Palestinian Authority President Mahmoud Abbas. Palestinian Authority President Mahmoud Abbas said there is “no way” he will recognize Israel as a Jewish state and accept a Palestinian capital in just a portion of Israeli-annexed east Jerusalem, rebuffing what Palestinians fear will be key elements of a US peace proposal. …Speaking to youth activists of his Fatah party, he suggested he would stand firm again, particularly over the demand that the Palestinians recognize Israel as a Jewish state. I may be missing something here, but it seems to me that if Palestine is demanding to recognized as a state that they should also be willing to recognize Israel as a state. I have seen the maps drawn by various Arab countries that do not include Israel, and it seems to me that if we are ever going to have peace in the Middle East that kind of foolishness has to stop. If the Palestinian government is going to demand recognition as a Palestinian state, they should be willing to recognize Israel as a Jewish state. In case you are new to reading this blog, I am going to end this article with something I have quoted before. To me, this quote sums up the history of the Palestinians. It is a quote by Walid Shoebat: “Why is it that on June 4th 1967 I was a Jordanian and overnight I became a Palestinian?” There has never been a Palestinian state (unless you consider Jordan, which is made up of land promised to Israel and then given to the Arabs to form a Palestinian state and then given to the Hashemites when they were driven out of Mecca). The whole argument for a Palestinian state is a rewriting of history. The land has never belonged to the Palestinians–the British called it Palestine as an affront to the Jews. Arutz Sheva posted an article regarding a speech PA Chairman Mahmoud Abbas gave today when he returned to Ramallah after the United Nations granted Palestine status as a nonmember observer state. There was a time when some people believed in a two-state solution. There are some people that still do. The problem is that the Palestinians believe in a one-state solution–they want Israel destroyed. You cannot make peace with people who want to destroy you. This is the equivalent of living next to a neighbor who keeps threatening to kill your family and take over your house. The appropriate behavior would be to notify the authorities, get a restraining order, and arrest the man if he sets foot on your property. Unfortunately, Israel is the only country taking the neighbor’s threats seriously. The General Assembly today voted to grant Palestine non-member observer State status at the United Nations, while expressing the urgent need for the resumption of negotiations between Israel and the Palestinians leading to a permanent two-State solution. This statement works only if you don’t know your history. In 1919 a formal agreement was signed in London regarding the Jewish homeland. The agreement was signed by His Royal Highness the Emir Feisal ibn-Hussein, representing and acting on behalf of the Arab Kingdom of Hedjaz, and Chaim Weitzman, representing and acting on behalf of the Zionist Organization. A Jewish state was to be established as soon as Jewish immigration and development was sufficient in the wilderness known as Palestine. The boundaries of the nation were codified and approved unanimously by the League of Nations. The land included in this agreement included what is now Jordan and much of the land won back by Israel in the 1967 war. In 1921, 75 percent of the land given to Israel was taken away from her by the British and given to Abdullah, the brother of Feisal ibn-Hussein. Abdulah was a Hashemite. The Hashemite tribe had just been driven out of Mecca and Medina by the Wahabi Muslims, so the Hasemites took over what was to be the Palestinian homeland (Jordan). So as you can see, the historical injustice against the Palestinians took place in 1921 and was perpetrated by the Wahabi Muslims–not the Jews. But facts are so inconvenient. As I have said before, until the Palestinians begin to build the infrastructure of an ordered society and stop teaching their children to hate, they should not be given a state. Creating a Palestinian state in its current form would simply be creating a base for terrorism against Israel. According to Wikipedia, hudna is an Arabic term meaning a temporary “truce” or “armistice” as well as “calm” or “quiet”, coming from a verbal root meaning “calm”. It is sometimes translated as “cease-fire“. Historically, a hudna has been used by Islamists as a time to re-arm for the next battle. I am afraid that the cease fire that happened between Israel and Hamas last night may fall into the category of a pause for the purpose of re-arming. Jennifer Griffin posted an article at Fox News last night about the cease fire. How do you make peace with people who celebrate a terrorist attack on innocent people? “The President said that he was committed to seeking additional funding for Iron Dome and other U.S.-Israel missile defense programs,” according to Prime Minister Netanyahu. Finally, when she shuttled to Ramallah, Clinton did not receive assurances from President Mahmoud Abbas that the Palestinians would no longer go to the U.N. General Assembly and request observer status on November 29 — one way that the Palestinians would get their aspiration to statehood recognized. After all, this issue of Palestinian recognition is the issue that serves as the backdrop to the current escalation of violence. I suspect we will be hearing much more from the Middle East in the coming days. Which Way Did The Money Go ? The Washington Free Beacon posted a story today about the lifestyle of Palestinian Authority President Mahmoud Abbas. Mr. Abbas has allegedly deposited nearly $13 million in U.S. taxpayer aid into a secret bank account. The Obama administration is not providing proper oversight for the $600 million in U.S. foreign aid to the P.A., Schanzer ( Jonathan Schanzer, vice president for research at the Foundation for Defense of Democracies) noted. Elliott Abrams, a former national security adviser for George W. Bush, recounted the behind-the-scenes talks he had with Arab leaders who refused to support the P.A.’s corrupt institutions. It seems to me that cutting aid to the Palestinians might be a very easy way to cut some government spending. If Mr. Abbas chooses to take part in ‘lifestyles of the rich and famous,’ the least he can do is do it on his own dime–not the backs of American taxpayers. On Friday the Washington Free Beacon posted a story about the $192 million in financial aid released to the Palestinian Authority (PA) by the Obama Administration last month. The money was quietly released to the PA after Congress froze the money because of Palestinian President Mahmoud Abbas’s attempt to declare statehood before the United Nations, by-passing the so-called peace process. I suspect that the claim that “The P.A. has recognized Israel’s right to exist, renounced violence, and accepted previous agreements, including the Roadmap,” is news to both Israel and the PA. Please follow the link above to the Washington Free Beacon article. The article lists recent examples of the kind of inflammatory rhetoric the PA routinely broadcasts to children and adults in the Middle East. Until someone requires both the rhetoric and the attacks on Israel to stop, there will be no peace in the Middle East. Until then, we are simply funding the PA war on a country that we claim to be a friend of.